To Carl Larsson there was nothing that you couldn't paint. He painted everything he liked, and he liked almost everything.Even though my current habit is divesting myself of so many books, I'm inclined to buy the three Larsson books to add to my collection. I tell myself it's for the children, but the truth is I could look at these for hours on end.This book, based (a translation of?) on Carl Larsson's 1899 book, Ett Hem, is a neat piece of Swedish cultural history. Here is another Larsson collection that makes me weak in the knees. It was fun to look at three paintings from different perspectives of the same room. The Punishment Corner, Suzanne at the Flower Window (one of my favorites) and The Lazy Corner are worthy of deeper study. I learned that Larsson first drew a sketch with pencils, then drew with ink, and later painted. This brings both clear distinct lines and the softness of watercolor. The colors remind me of IKEA (not the blue and yellow, but the IKEA look): bits of bold and bright amidst calmer pastels. The Swedish houses were typically filled with dark colors. Larsson painted paneling light colors. They thought he was strange.The detail draws you in to the paintings. This would be a good book to have on hand for the children! This book includes several of Larsson's paintings that I haven't seen in my other books about Larsson. The descriptions, explaining details of each image, are very helpful, but the text doesn't read smoothly, which may be a translation issue.I think this is supposed to be for children, but instead of reading it aloud, I'll look at the book with the kids and we can talk about each image, which is when I can add info from the text.The paintings reproduced here look faded, which is too bad. I like this one even a little better than A Farm: Paintings from a Bygone Age, mostly because I love paintings of interiors better than landscapes. This beautifully written book describes the reissued watercolor paintings of Carl Larsson, the Swedish artist and designer. The painting of the interiors of the delightful home he shared with his wife Karin and their 7 children truly explain his unique style and how he painted everything he saw, including walks, ceilings, shutters, cupboards, and drawers. He was a woodworker and added on to his small house so many times that is appeared to be hobbit like in its additions. This is not a children's book, but children would enjoy it very much. The details in the interior scenes of his home seem fairytale like in their innocence. Each painting is given a full description with background on how or why he chose the subject matter. It is a nice short biography of Sweden's master artist with uplifting watercolor scenes painted by his own hand. This beautiful book of Carl Larsson's watercolor paintings is accompanied by Lennart Rudstrom's text. Although it is aimed at children, it is very informative about the Larssons' homelife. Carl's style reminds me a little of Tasha Tudor. This would make a perfect coffee table book. This is not a children's picture book, as I thought, is is more of a coffee table book with Carl Larsson's paintings and some notes about the pictures and about his life. Carl Larsson painted the interior of his home. Grown-up fans of Tasha Tudor and Beatrix Potter will probably like this book. 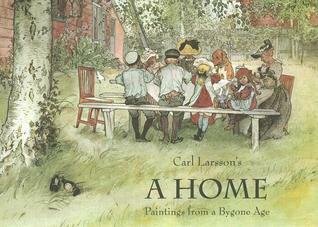 I love this book so much...Carl Larsson's gorgeous paintings and a child-friendly explanation of home life. Of course, it makes me wish I had paintings on all my doors and walls, and feel like a slacker for not weaving any tablecloths of our own! I found these paintings enchanting. I just love how everything is decorated. Wish my house looked like that!